With its innumerable varieties, cabbage is considered the king of the family of cruciferous vegetables, which also includes Brussels sprouts, turnips, kale, collards, mustard greens, rutabaga, broccoli and cauliflower. Cabbage averages about 30 calories per cup and is an excellent source of potassium, calcium, dietary fiber, and vitamins A, B6 and C. The dietary importance of cabbage led the United Nations’ Food and Agriculture Organization to list it as one of the 20 most important vegetables for sustaining populations worldwide. Braising cabbage involves wilting it in some type of fat, such as vegetable oil or animal fat, then slowly simmering it in a flavorful liquid over low heat in a covered pot. Braise any variety of cabbage; most recipes require you to slice it thinly. Chinese cuisine, in which cabbage is a staple, often incorporates braising. “Red cooking” is a traditional Chinese braising technique that calls for wilting the cabbage in peanut oil, then simmering it in a mixture of chicken broth, soy sauce, dry sherry, rice vinegar, peppercorns and five-spice powder until the cabbage takes on all the flavors and a deep red hue. To sauté cabbage, cook it with vegetable oil in a frying pan over high heat. As with sautéing other leafy greens, constant stirring is critical to cooking it evenly until it wilts. Sautéed only in oil, cabbage takes on a mild, sweet flavor, but don't hesitate to add any number of herb and spice combinations. 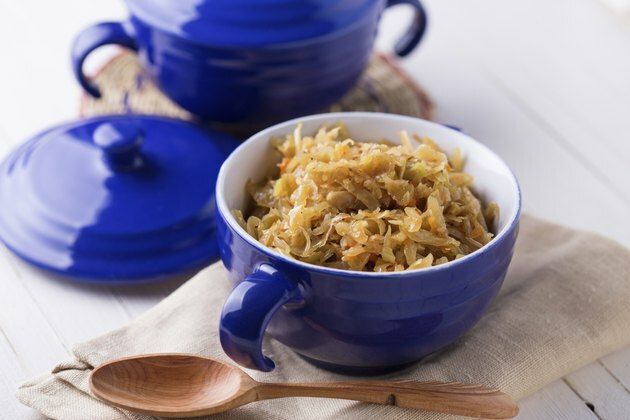 Curried cabbage is a classic side dish that requires heating vegetable oil, curry powder and onion together in a skillet. After wilting the cabbage in the curry mixture and removing it from the heat, add a dollop of plain yogurt and some fresh lemon juice to finish the mildly spicy dish. Steaming cabbage is one of the best ways to prevent the loss of nutrients through leaching during the cooking process. Because the technique doesn’t require adding fat and extra calories in the form of vegetable oil, butter or other animal fat, it’s also one of the healthiest ways you can prepare cabbage. Slice, shred or roughly tear the leaves and place them in a saucepan’s steamer basket over an inch of rapidly boiling water. Cover the pan to allow the cabbage to steam until it’s tender, turning the leaves once or twice for even cooking. Add salt and pepper or freshly squeezed lemon juice to taste. Boiling is a simple, classic way to prepare cabbage. But if you overboil it, cabbage will taste bitter, as its sulfurous compounds are drawn out. Before boiling cabbage, remove the tough inner core and slice, chop or quarter the remaining head. The boiling time will vary depending on the cabbage, but is typically between five and 10 minutes. “The Silver Spoon” recommends submerging green and Savoy cabbages in salted boiling water and removing them once the water returns to a boil. As with steamed cabbage, season it with a little lemon juice or olive oil to taste. Consider cooking your cabbage in the oven. Cut it into wedges -- 4 to 6 wedges per cabbage -- lightly drizzle with olive oil, season with salt and pepper and then bake until tender. Alternatively, you can shred cabbage and add it to homemade lasagnes or casseroles. If you're in the mood for something a bit more elaborate, try making cabbage rolls -- a filling of lean ground turkey, brown rice, onions and peppers makes for a flavorful meal, while a filling of quinoa, brown rice, red pepper, sage, thyme and rosemary offers a vegan-friendly option.